Network. I was provided the album to review but all opinions are my own. I love music! There's just something about a great song that can lift your spirits, make you get up and dance and make the most mundane task a little more enjoyable. I mean, I'm surely not the only one who puts on some music and dances like a crazy person while I'm folding laundry or vacuuming the floors, right? If you've been following my blog long, you've probably guessed that my favorite genre of music tends to be Christian music, and that's true... but it's not the only kind of music I enjoy! I actually have quite an eclectic taste and I'm always willing to give something new a shot. Or something new from an artist I know. And for those times that I feel like being goofy and dancing around (because believe me, when I dance...it's goofy), nothing beats good ol' pop music. 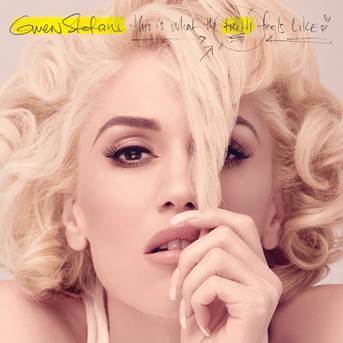 In the past, I have enjoyed some songs from both No Doubt & Gwen Stefani and so I was excited to be given the chance to experience her all new album- This Is What Truth Feels Like- for myself. This carefully crafted album is Gwen Stefani's most personal album to date. It includes intimate songs such as “Make Me Like You”, “Misery” “Truth” and “Used To Love You” in addition to tracks from producers Mattman & Robin, Greg Kurstin, JR Rotem and Stargate. This is an emotional album feauturing those universale themes of love and loss. Like I said, I was pretty familiar with Gwen already- who isn't. But if I were to be honest, I've always been half and half on which of her music I like. There are some of her hits like 'Don't Speak' and 'Underneath It All' that I absolutely loved. Songs with great lyrics and messages behind them. Some of her other more 'hip-hoppy' songs like 'Hollaback Girl' just weren't my preferred taste. This album- though more mature I think than previous- was a pretty good mix of both. Personally, I was drawn to those more heartfelt songs like 'Truth', 'Me Without You' and 'Rare'. If I had to choose a favorite between the three, it would probably be 'Truth'. Much like those other Gwen Stefani songs I enjoyed in the past, these had great pop beats combined with fantastic lyrics, and of course Gwen's beautiful vocals. Meanwhile, there were a few titles on the album that I found myself skipping through- such as 'Naughty' or 'Asking 4 It'. Not that they aren't great songs too, just not my preferred style! However, if you are already a die hard Gwen Stefani fan, I have no doubts that you will not be disappointed! It's a fantasticly heartfelt album that fans are sure to be listening to over and over again. Are you a Gwen Stefani fan? What songs are you most looking forward to from the new album? Ive always loved gwen too!! Reminds me of my childhood :) She'll forever be fabulous!! I much preferred her No Doubt years myself!! I will have to check out her new album! Gwen has a GREAT Voice!! Liked watching Gwen on "The Voice"!!! Gwen & Blake make a CUTE Couple!!! I saw her on Saturday Night Live the other day & loved the new songs! She can be depended on to make great music! I've always been a no doubt fan so I feel like I would definitely like this cd, plus I need some new music for running. Did you know you can create short urls with Shortest and earn money for every click on your short links.